In the opening week, Shazam made $160 million in the box office globally and is astounding audiences everywhere. Shazam is a little bit different when it comes to superheroes given that he is only about 14. Billy Batson, played by Asher Angel, and Shazam, played by Zachary Levi, do an incredible job at being the same person. Levi plays a boy trapped in an adult’s body with superpowers exactly as you would think a boy would act. The acting all around the table was phenomenal. The story follows young Billy Batson, a young boy who has spent the majority of his life in foster care running away from every home he has been put in. Billy finally ends up in a house with five other foster kids who have found their home. Billy is given the powers of Shazam by the previous master and given a task to stop the seven deadly sins from wreaking havoc on the earth, a pretty large task considering Billy is only 14. The storyline is great and pulls the audience in really well. Altogether, the movie is following the trend of recent DC movies and is up there with the best that the DC Universe has offered. Nate Livingston said that Shazam is “one of my favorite DC movies, it’s a little better than Wonder Woman and just as good as Aquaman.” This movie holds its weight and then some. Shazam has a 91% critic score and a 90% audience score on Rotten Tomatoes, giving it the best score for a DC movie since Wonder Woman in 2017. The DC Universe has stepped up its game and has truly taken a step forward in the cinematic world of superheroes. However, is it too little too late with them losing both Ben Affleck and Henry Cavill as the iconic Batman and Superman? With the loss of arguably their two largest actors, where is the DC Universe headed? After looking at all the good in Shazam, it is time to take a look at a little of the bad without spoiling the movie. The movie is funny and light-hearted but comes up short when it comes to the climax. All the way up to the last 30 minutes of the movie, everything is great; unfortunately, the climax does not match the strength the rest of the movie has. The ending is not wrong or even bad, but it just is not as good as the rest of the movie. 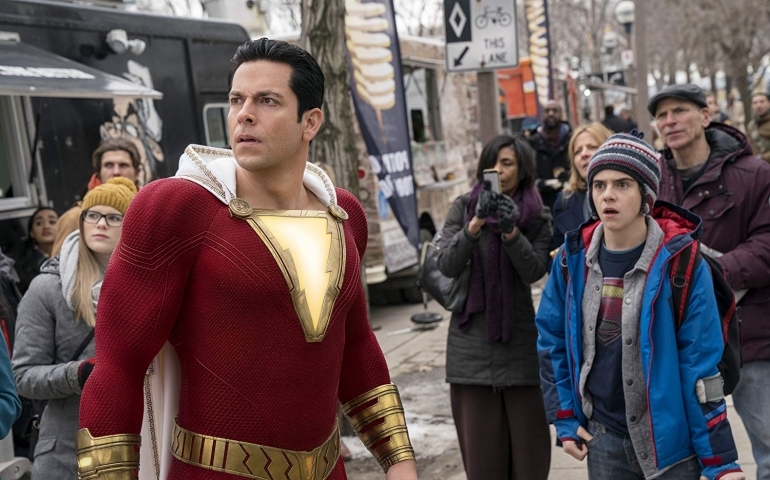 There are two post credit scenes one, as usual, is a comedic scene that was hinted at throughout the movie, and the second one hints at the future for Shazam and who might be his next adversary. In the end, this movie is worth watching especially if you like a bit of humor with your superheroes.